Courage Campaign | Oil companies profit. Californians clean up the mess. Oil companies profit. Californians clean up the mess. Fracking is out of control in California. There are 47,000 active fracking sites currently operating with almost no regulation. Reports from around the country are chilling: poisoned drinking water, oil spills in residential neighborhoods, and now Exxon Mobil and Shell are targeting California's Monterey Shale. Reports claim it holds 15 billion barrels of oil, but it can only be reached through dangerous, experimental fracking methods. 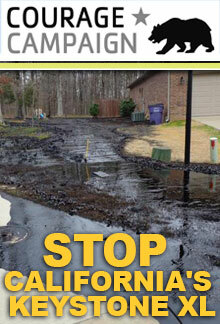 Oil fracking is even dirtier than natural gas fracking. The oil in the Monterey Shale contains more carbon than oil from the Canadian Tar Sands, which would be transported in the Keystone XL pipeline. With California's high standards for clean fuel, all of the oil must be exported. That means oil companies profit, other states get the gasoline, and California is left to clean up the damage to our land, air, and water. Sign on to demand Sacramento: "Protect California's health and environment. Implement real fracking regulation, or stop the practice immediately."